The author of this paper Angela Cavill-Burch speaks from personal lived experience of various aspects of the care system in the UK. Her eldest brother has a severe learning difficulty which he sustained following a brain injury caused by T.B. Meningitis in 1967, her Mother has had recurring episodes of serious mental psychosis since 1972, and finally her Husband in 2007 was struck down with a life changing Staphylococcus infection that has caused a high level Spinal Cord Injury. Although her Husband qualifies for NHS Funded Continuing Health Care it has been extremely difficult to find suitable, qualified and consistent care-workers to enable Angela to return to work, knowing that her Husband is being adequately cared for at home. Her mother has ended up inappropriately in a very poor-quality care home due to the lack of supported housing in the community. The only marginally good story is that of her brother who lives in a house with a few others with high LD needs supported by a great group of care workers but his home is nearly a hundred miles away from his family. Having heard of various initiatives to plug the huge vacancy gaps in the care-work industry I feel compelled to write this paper as the last thing people who rely on the care system need is yet another influx of totally unsuitable people into the industry. Lots of events over the last fifteen years have led to a near collapse of the quality and provision of care-workers. · down turn in the construction / other traditional industries leading some to turn to care-work. · increase in zero hours contracts leading to bad pay and conditions. · handing over of care contracts from being council controlled and run to privately run care agencies leading to a dilution of standards of provision, training, and some financial impropriety. · Increase use of personal health budgets, leading to amateur (through no fault) employers of care-workers further de-skilling, de-professionalising care-work. · Councils because of the over whelming pressures of the increasing numbers of people in the community with complex health needs, increasing ageing population and ever decreasing budgets have inadvertently pushed quality down. · Similarly, the NHS has the same problems, decreasing budgets, many reorganisations, pushing them to get people out into the community care system sometimes too quickly. · The housing crisis also has played its part in two areas, lack of accessible properties for people with complex health needs to live where it is a safe environment to provide good quality care and lack of housing that those in lower paid jobs can afford to live in. As the vacancy numbers rise there seems to be an increasing pressure to hire anyone willing to try being a care-worker. I have heard that the DWP are “encouraging” the unemployed to try care-work, locally that colleges / care agencies are offering care apprenticeships. On the surface, this sounds like worthy initiatives, but to those of us that rely on care provision it rings loud alarm bells. · A 64yr arthritic care-worker sent to do a night shift, told take a book to read, to cover my Husband who needs constant intervention during the night including re-positioning, physio, toileting etc. · A care-worker with uncontrolled diabetes, liable to pass out looking after someone totally dependent on safe care. · Frequent late arrivals, non-arrivals, short term cancellations, lack of contingency planning making it impossible for me to return to full paid professional level work. · Care-workers turning up with sickness when Husband is immune compromised. · Care-workers caught discussing our personal circumstances with unauthorised personnel. · Care-workers treating totally compos mentis Husband with disrespect when I was not around. · Care-workers that did not have the specific medical training needed. · Had to call 999 for one care-worker after he collapsed in our home. · Care-workers working too many hours plus travelling too many miles to do a good job. · Care-workers not knowing how to cook. · Care-workers that hygiene was an alien concept. · Care-workers sleeping on waking night shifts. All, of the care-workers we have had did not give us the confidence that they knew what they were doing, some we put up with because they were pleasant individuals to have around and at least I could leave the home for a short while knowing that between care-worker and Husband they could summon more appropriate help if not myself rushing back home. I know that our experience is slightly different as we need quasi-nursing standard care for my Husband him being such a complex case. Unfortunately, it is the same companies in many instances providing staff for both complex and simple cases. Many of the care-workers we had provided would have got away with their low level of training / suitability in a more social care setting. Firstly, I think the government has a role to play here, so that those that have currently paid into the system and believed that by doing so they would be taken care of in their old age or disability are just that taken care of appropriately. In the medium-term the government needs to put extra funds into the system so that it can cope. A decision needs to be made, a new societal contract made with young people starting work now, that provides ring fenced funding set aside for their generation reaching the need for either disability care or old age care. Funded by whatever form the experts in public finances deem necessary, insurance policies, direct taxation etc. The drifting on from crisis to crisis, smacks of policy makers sticking their heads in the sand hoping it will either go away or they will leave office before they must deal with it. Taking Mediocrity out of Excellent Care Provision. Care Agencies- the role of these Agencies needs to change. The emphasis needs to change to being more like specialist recruitment agencies, keepers of databases of care-workers levels of competency, specialist licensed, audited training schools. Councils and NHS bodies need to take back the control of care-worker deployment, strengthening the relationship between clients and the procurers of that service. With agencies involved it has become too hands off to the detriment of people needing care services. Recruitment- although in the public psyche railways are not the bastions of good public service I think the care sector has a lot to learn from this industry. Being under extreme public scrutiny all the time the Rail Industry has in fact developed some very sophisticated training regimes, especially in front line safety critical roles such as train driving and signalling. 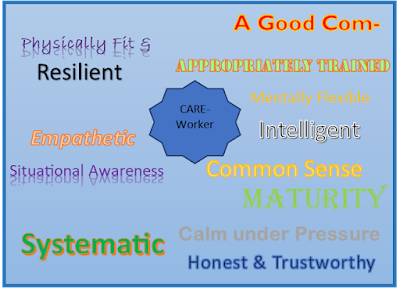 One area I would like to see the Care Sector emulate is the psychometric testing of candidates for suitability to be a care-worker before they enter the service. 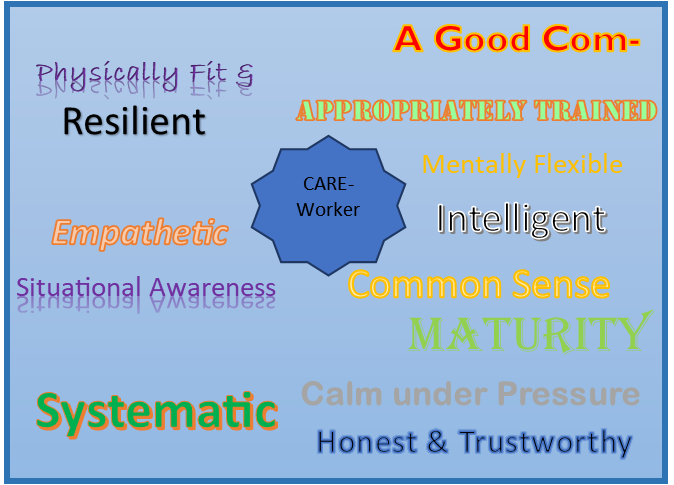 There are some very specific skill and personality traits that are needed to be a successful care-worker, that presently not enough attention is paid to identifying and weeding out of unsuitable candidates. 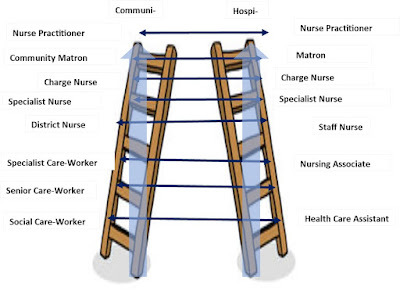 Everyone needs to realise that Care-work cannot be seen only as an entry level dead-end job, if we are ever to move the industry on taking out the mediocrity out of excellent care provision. Some of these can be taught / developed but many are innate and personality traits, which can be tested for to get the right fit. Career Progression- until care-work is seen to be more than a dead-end low value job, it will continue to be an industry that does not attract career minded men, and have staffing vacancy problems. It is of course recognised that as in most career types there will always be a core that train up to the lower levels and stay at the level, which is absolutely, consistent and complementary with the aims of strengthening the sector. We need more numbers of base line trained care-workers for social care than the more highly trained specialist care-workers. By having well trained base-line Care-workers there is a sound foundation on which to build a core of better trained specialists. Care in the community is still seen as the poor cousin of hospital care and has the lack of kudos status to match. 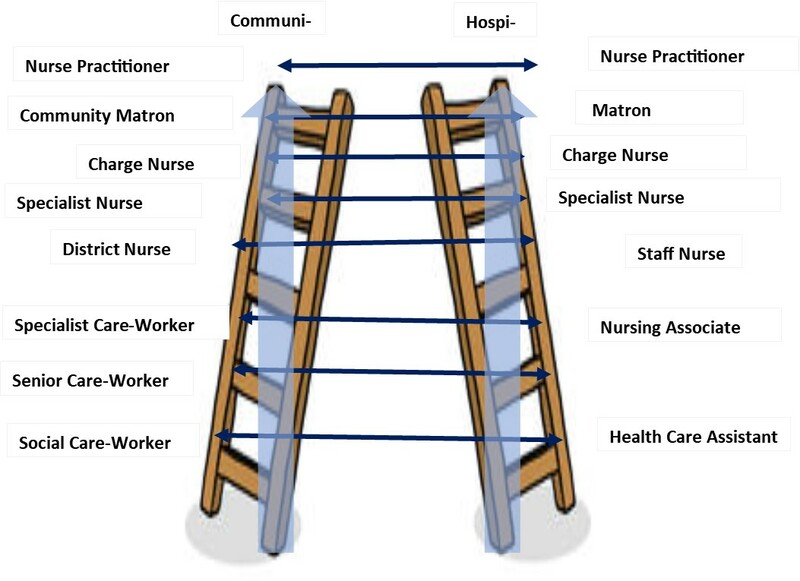 The UK needs to reform the career ladder available to both in-hospital staff and community based staff with equivalency between the two and the ability to move between the two ladders. Apologies to readers pictures do not copy well to this blog - hopefully you get the general idea. Care-work and the hospital role of Health Care Assistant also needs to become a registered career, this would go some way to address the lack of status in the industry. There needs to be a route to training and testing to enable people if they wish to progress all the way from the entry level positions right up to Nurse Practitioner. Training- training of Care-workers is sporadic and variable in quality. This was an inevitable consequence of the proliferation of suppliers of care-workers. Care-work needs to have recognisable national qualifications so allowing care-workers flexibility in selling their skills in the national marketplace. Organisations giving the training need to be audited against a national standard. For example: A Train Driver is trained in core skills that are applicable where ever he/she works but has add on training modules that reflect local requirements as well. Core-Skills – Adult /Child Safe-Guarding Briefing, Basic First Aid, Basic Cookery & Nutrition Skills, Appropriate Hygiene, Manual Handling, Communication in Emergency Situations, Prevention of Pressure Sores, Exercise for people with poor health, Safe Control of Medicines, Mental Health Briefing, Dementia basic training, How Temperature & Blood Pressure works, Conflict Resolution / Avoidance, Safe Pushing of Wheelchairs & etiquette, basic health and safety. Add-Ons for Medically Based Specialist Care-Work – safe use of hoists, advanced manual handling, taking blood pressure & what does it indicate, various catheterisation techniques, taking a temperature reading, management of bowel regimes, Glucose Level Management, Nutrition for Specialised Conditions, use of various pieces of specialised equipment, safe use of oxygen systems, Basic Physiotherapy, Basic Occupational Therapy (not an exhaustive list). Add-Ons for Senior Care-Workers – how to risk assess, carry out assessments, write reports, lead a team, audit, interview, train/mentor others (not an exhaustive list). Qualifications – there should be a basic entry level nationally recognised qualification, with extra modules being taken that have points associated with them that add up to extra levels of qualification. Bit like the Open University qualification system, in fact it would be good if this organisation were employed to develop the care-work national qualification system as they already do some nursing training. Pay & Conditions – pay should reflect the complexity of the level of care being given, with local add on payments for areas where local housing costs or other local issues, cause problems for lower paid workers or local recruitment. The national living wage I would content is slightly under what even a basic level fully trained care-worker is worth. With what care-workers must know and the fact they are looking after the some of the most vulnerable in our society I feel their hourly rate should be equivalent to £10 per hour minimum, increasing proportionally with the modules they require to do their jobs. It would be good to see a move away from care-work being seen only as hourly work but as a salaried career. Perhaps a good mixture between the two would cater for those that want to work part-time and those that need the stability, and credit rating a salary gives. It is absolute folly to perpetuate the idea that Care-Work is unskilled, menial work. If done correctly it is anything but. We all need to ask ourselves, who do we want to look after our parents, our disabled brothers, sisters, kin folk, friends? Surely it is well suited, trained, and paid individuals that want to work in the sector, not those that couldn’t get a job elsewhere, so thought they would give it a go or get coerced by civil servants just seeking to get the unemployment figures down.